Major Vince Deluca had come to Cleveland to help a mentor. He had gotten into trouble as a kid, and Don Bassett had helped. Instead of being behind bars, Vince was now career military, working on experimental machines, and helping keep the world safe. Now he was being asked to help keep Don's daughter Shay safe. Vince had liked Shay back then, but Shay had gone with Tommy. Then there had been the night that had changed their lives forever, and Vince and Shay hadn't seen each other since. Shay knew she was working in an unsafe neighborhood, but the community center was needed there. They worked with the youths, trying to guide them to a criminal free adulthood. Unfortunately, many of them were already hardened to life, and lived dangerously. When Vince shows up, she's unsure why he has come. His excuse doesn't make sense, neither does the fact that he continues to appear when there is danger. What she doesn't realize is that Vince is part of a task force trying to determine whether Shay is involved in a terrorist plot. Don and Vince are convinced differently. Soon, however, proving Shay's innocence takes a back seat to keeping her safe. 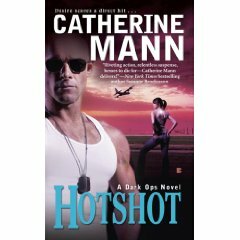 Hotshot is the second story in Catherine Mann's Dark Ops novels. This time, the team is working here, in the US, to protect against terrorists who may have infiltrated gangs. It is always sad to see kids, not quite adults, but still forced to make decisions that will forever affect their lives. I enjoyed the romance between Vince and Shay, as they worked through their past to find a future together.